I am on an endless quest to find more than 5 recipes that I can make in the crock-pot that everybody likes....okay, to find more than 1 recipe everybody likes. Really the only thing I have EVER made in the crock-pot that isn't met with disdain is the Pot Roast with Peppers. I have tried about a million other things--much to everyones distress--but to no avail. We eat most every possible kind of food and so do the kids, so you wouldn't think this would be so hard. We just universally don't like wet, tasteless meat and that is pretty much what I always end up with. We just have never gotten the "food is fuel" memo and still expect everything we make to taste like we worked all day at it. The best crockpot tip I was ever given was by a co-worker that told me I didn't have to add liquid at all. She was very right, and may I say that "her" crockpot bbq wings are always delicious. I have never had her luck with those, however....mine are always just slimy-ish. So, as I was driving home from kid drop off this morning, I was already thinking about dinner. I had to stop at Walmart anyway and I REFUSE to buy meat there so I had to pick up just additions to what I had at home. I thought of some hamburger meat leftovers and thought I had been so creative by thinking of adding it to cheese soup for---wait for it----Cheeseburger Soup. But, alas, there are recipes for it all over the internet so I cant quit my job and write cookbooks for a living just yet. Bummer. Anywhoo, I found one recipe without too much colorful stuff floating in it--that is always a deal breaker for the kiddos. 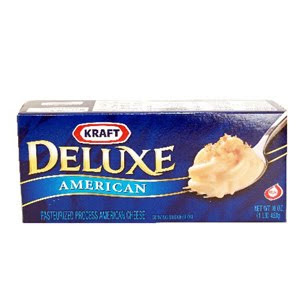 I had to low-carbify it for our purposes and I have some mental block when it comes to "cheese food" and "velveeta", so I bought this stuff instead. I like to feel, in my own twisted brain, like I am not l poisoning my children.....I probably still am, but at least this has the claim of being actual --though tasteless-- cheese. Put the first 5 ingredients in the crock-pot and cook on low for 6 hours. Turn crock-pot to lowest setting or just off about 30 minutes before serving and add the milk first, then the cheese. You dont want it boiling when you add the cheese or it will curdle, so add the milk first to cool it slightly. It will still be plenty warm to melt the cheese over the next half hour or so. Garnish with tabasco sauce, crumbled bacon, sour cream....whatever. We made this just as it says. We didnt garnish with anything and it was very good. Kinda like Cheeseburger Macaroni soup without the macaroni....same kind of taste. I should have taken a picture, but i didnt. We will definitely make this again because it is very simple and quite good. We didnt have any (carbs dontcha know), but this would be awesome with a big loaf of crusty bread for dipping. Putting that one on the back burner, fo sho. I just reheated the leftovers and they were even better. I likey! !